You must pardon Pretty Lady for being rhapsodic and strange, this evening. It was roughly seventy-five degrees and sunny in New York City today. I might remind you that today is the ninth of November. The Christmas cactus is putting out buds. So Pretty Lady went for a long, pointless stroll, just because she could. Pretty Lady gets along well, these days, with duennas of high-end clothing stores. She is not certain why this should be so; she is, regrettably, not in the economic bracket of those who become regular patronesses of high-end clothing stores. Nevertheless, she falls into easy, cheerful conversation as she tries on clothes she has not the resources to buy, nor the occasions to flaunt, and comments upon masterful tailoring, innovative use of fabric, and daringness of styling. Hint: ai ai gasa on 5th avenue. The dress with the black-and-white photograph all over it, the reflector-tag detailing, and the petticoat. They'll tell you what size. 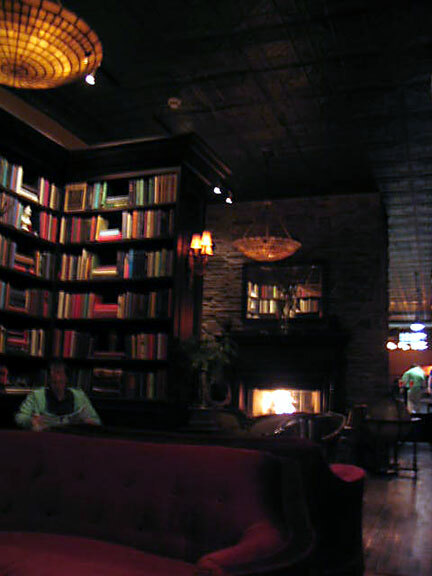 As she was strolling down Union, she happened upon perhaps the most beautiful bar in the world. Roaring fireplace, you note. Tall bookshelves. Comfy velvet armchairs. Wood floors, tin ceilings, inviting little lamps. Some sort of throw-the-ball game in the back that was Not Pool. Fleur-de-lis wallpaper. If you will believe it, for a moment Pretty Lady was not sure she would be allowed in. It seemed to her nothing short of incredible that for the price of a happy-hour draft beer, she would be allowed to nestle in an armchair, next to a roaring fireplace, and dawdle over a book and journal for however long she pleased. But such proved to be the case. Indeed, capitalism has its comforts and small joys. I have to admit there are benefits to living in the midst of it all like you do. Though my heart still longs for the still places of solitude. Actually, mine does too. It's just that capitalism is what is supporting me (mostly), so I'm attempting to put a bright face on it. Plus I haven't found the right person to be solitary with. In Soviet Union, armchair nestled YOU. It is arguable that "capitalism" was a bugaboo word used to frighten young socialists at bedtime. Ssshhhhhh, Pretty Lady, guard the address and name of said establishment with your life!! If you *must* take friends, blindfold them for the journey! Pieces of heaven like that do not remain so for very long after they've become popular, it seems, so keep it under your hat!! "Plus I haven't found the right person to be solitary with..."
That is a critical skill to have, to know how to be together and maintain solitude. It is so important to know when and how exactly to be quiet together. Crom, I'm noticing a Pattern, here. It seems you have a tendency to trip up on the high-maintenance, troublemaking versions of femininity, as I do on their high-maintenance, troublemaking masculine counterparts. Let us make a pact. First whine, they're out. Deal? Mitzibel, you are So Right. In fact, I stumbled onto it at 5:30, while the majority of the armchairs were still free; by 6:15, it was well on its way to becoming a madhouse. Let's hear it for early evenings. I have to maintain a reputation as Master of the Bleedin' Obvious! What a cool place. Only in NYC... How I miss New York.